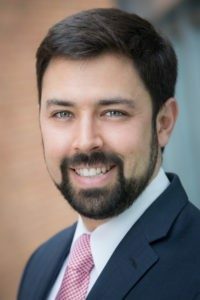 RALEIGH, N.C. – Shanahan Law Group, PLLC is pleased to welcome Andrew Brown as a new associate. Andrew’s experience in the North Carolina court system will be a valuable asset to the firm. Andrew received his Juris Doctor from UNC Chapel Hill in 2013. Since then, he has served in three roles in the North Carolina Judicial Branch. He began his career as a law clerk for NC Supreme Court Justice Robert Edmunds, followed by the role of Chief of Staff and Counsel for NC Supreme Court Chief Justice Mark Martin. Most recently, Andrew served as the Director of the Office of Strategic Initiatives at the NC Administrative Office of the Courts, where he led efforts to implement recommendations made by the North Carolina Commission on the Administration of Law and Justice. In that role, he founded the North Carolina Judicial Fellowship, an office that provides independent and confidential legal research and writing support to the 370+ judges comprising North Carolina’s Superior and District Courts. As Director of the Fellowship, he supervised an office of ten lawyers, presented to judges at judicial education conferences, and traveled the state meeting with judges and their staffs. With Shanahan Law Group, PLLC Andrew will concentrate his practice in civil litigation, corporate law, and appellate litigation. “Andrew is the kind of passionate leader we happily welcome to our team. His experience and dedication are a great fit for our firm’s complex case management and entrepreneurial culture,” said Partner Brandon Neuman. Shanahan Law Group, PLLC is a boutique law firm in Raleigh, North Carolina that offers a full range of litigation and business services. The firm’s multi-faceted team of attorneys provide strategic advice to clients in numerous practice areas, such as complex litigation representing both plaintiffs and defendants, banking and financial institutions, commercial real estate, corporate governance, directors and officers litigation, insurance policyholder litigation, white collar defense and government representation. To learn more visit https://shanahanlawgroup.com.